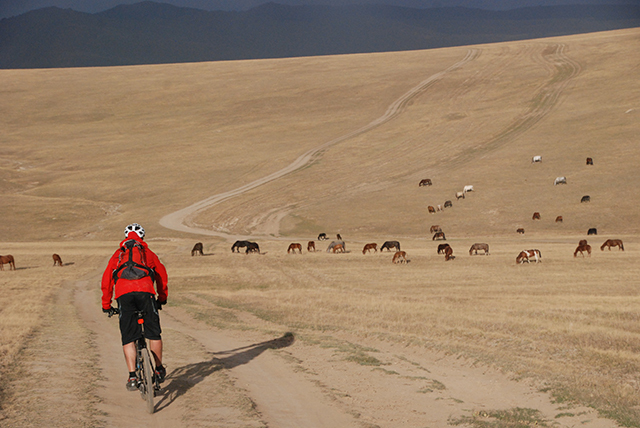 In Kyrgyzstan, Central Asia’s ‘Switzerland’, this mountain bike adventure starts in Bishkek, the green capital where time seems to have stopped. Departure on June 14 and August 2, 2020! Duration: 16 days, including 10 days mountain biking. The event will be organised with a minimum number of 6 participants. In case the event has to be cancelled, you will be informed not later than 4 weeks before the scheduled departure dates. When the minimum number of participants is registered, you will be informed directly on the exact dates the event will take place, including details regarding the travels involved. A 150 km bus transfer will take you from the airport to the Chon Kemin Gorge, a wonderful location to get used to condition at an altitude of 1600 m. We have a spectacular view on a valley filled with impressive trees and snow covered mountain tops, showing glaciers. A guesthouse provides dinner and lodgings fort he night. After breakfast we mountain bike over a20 km gravel road to the Kalmak Pass, followed by an additonal 30 km to Balykchi City. We pass by the Tokoi Reservoir at an altitude of 1700 m, where lunch will be served. With renewed energy we continue by bus to Kochkor, some 60 km further ahead, where we have a look at its craftsworks. In addition we visit a local family well known for its manufactures felt products. Dinner is served by local people, who also offer us lodgings for the night. 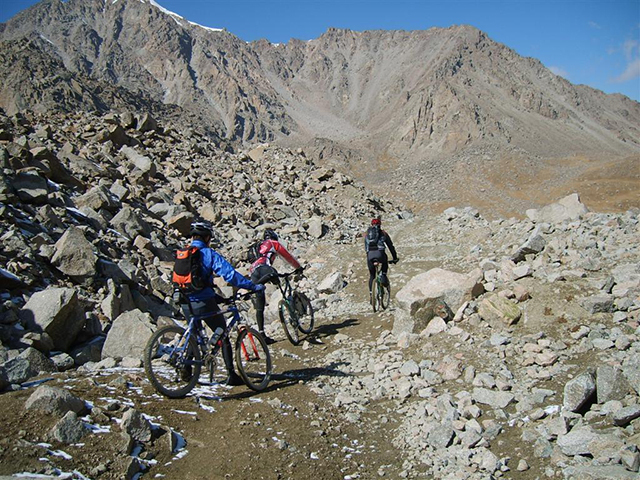 Today’s mountain bike tour leads us almost only over gravel roads en brings us from Kochkor on to the Chaar Archa Pass. After having enjoyed lunch and an additional mountain bike trip we will great pleasure in camping in comfortable tents at an altitude of 2700 m.
After breakfast we start our stage today along a relatively flat mountain bike track to the Kara Keche Gorge. Today we will cover a distance of about 80 km before we enjoy dinner and our lodgings in camping site tents at an altitude of 2648 m.
The first 20 km mountain bike trip today brings us to the Kara Kech Pass, where we will enjoy an immense spectrum of colours radiated by the magnificent landscape that surrounds us. Following this passage we stop for lunch at an altitude of 3384 m, after which an additional 30 km of mountain biking takes us to the area around the southern part of Lake Son Kul. 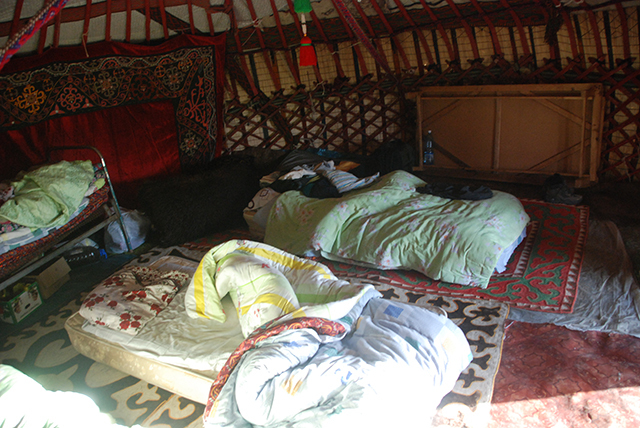 We enjoy our today’s lodging in traditional yurts at an altitude of 3016 m.
Over mostly gravel roads we mountain bike today to the Kalmak Ashuu Pass surrounded by a suprisingly beautiful landscape containing dry and stony desert-like sites as well as endless lush alpine meadows covered with gorgeous flowers like edelweiss. At the finish of today ‘s 70 km mountain bike trip we enjoy our lodgings close to the Kara Kudjur River in a camp of tents at an altitude of 2700 m.
Today’s 70 km mountain bike tour bridges a 2845 m difference in height, thus requires quite a bit of climbing and going down. At an altitude of 2985 m we reach a campsite where we will stay overnight in comfortable tents. Following breakfast a 45 km mountain bike tour over bridle paths takes us through the splendid mountainous area to the Jalpak Bel Pass. You will not only enjoy the scenery but also imagine yourselves being alone on the earth’s surface; that’s how gorgeously the natural surroundings here engulf you, so to speak. We stay overnight in camping tents at an altitude of 3200 m.
After having enjoyed breakfast a 70 km off-road mountain bike tour along the shores of the Balgart River will take us to Jiluu Suu Hot Springs. Along the way we will have lunch, followed by ample opportunity to relax in some natural hot springs around. We enjoy dinner and will stay overnight in tents at a campsite 3300 m high up in the mountains. Today’s 80 km mountain bike tour takes us through Tosor Pass, where we start a bus transfer to Kaji Sai, some 25 km further down the road. This village is situated at the shores of Ish Kul Lake, inviting us to take a refreshing dive into its clear water. We enjoy our today’s lodgings in a guesthouse at an altitude of 1750 m.
The last mountain bike tour today! After 25 km we reach Skaza (Fairy Tale) Canyon, owing its name to the typically wind shaped rock formations showing silhouettes of the Great Chinese Wall, dinosaurs, castles, snakes and dragons in the most impressive spectrum of colours. When time allows a swim in beautiful and clear natural lakes nearby is an option. Again we stay overnight in a guesthouse, some 1750 m high up in the mountains. Following breakfast a 360 km bus transfer will take us back to the capital of Bishkek. In the evening we enjoy dinner there and stay in a guesthoude to spend the night. Today’s program includes a city tour through Bishkek, followed by a bus tour to Ala Archa National Park. Like yesterday dinner will be served in the guesthouse in Bishkek, where we will stay overnight for a last time. After having enjoyed breakfast a bus transfer will take us to Bishkek Airport for our international flight back to The Netherlands.